2.1 What is Alexa ? 2.2 What is Echo Dot ? This post is about Voice Based Home Automation with NodeMCU & Alexa using fauxmoESP. This IOT Project tutorial is based on the great open source lib & example developed by Xosé Perez (Tinkerman). Alexa is capable of voice interaction, music playback, making to-do lists, setting alarms, streaming podcasts, playing audiobooks, and providing weather, traffic, and other real time information. Alexa can also control several smart devices using itself as a home automation hub. 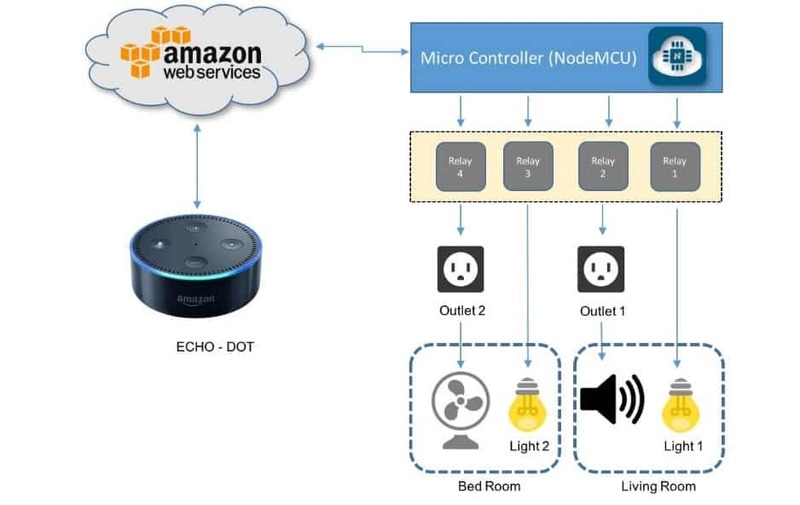 We will use on this project, the “Echo-Dot”, that allows users to activate the device using a wake-word, such as “Alexa” or “Computer”, as in “Star Trek!. In the home automation space, Alexa can interact with several different devices as Philips Hue, Belkin Wemo, SmartThings, etc. What is Echo Dot ? Echo Dot is a voice-controlled speaker that uses Alexa to play music, control smart home devices, make calls, answer questions, set timers and alarms and more. Following are the list of components for designing Voice Based Home Automation with NodeMCU & Alexa Echo Dot. 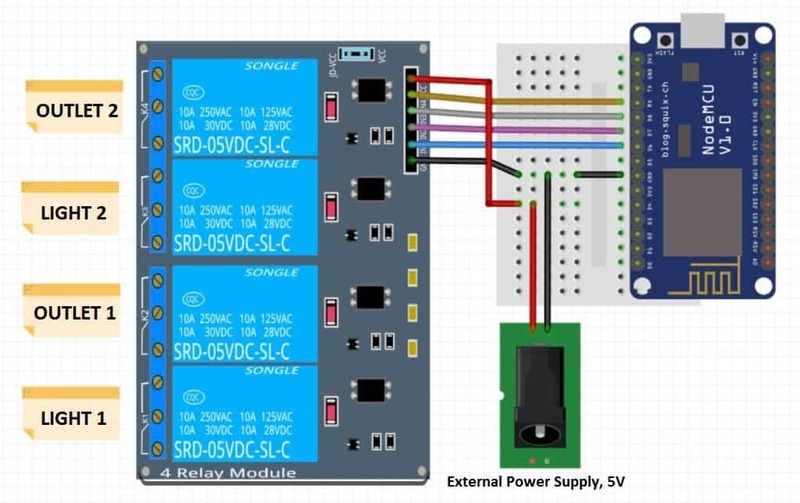 Assemble the hardware as shown in the figure below on your breadboard for Voice Based Home Automation with NodeMCU & Alexa using fauxmoESP. Go to Board Manager and Instal NodeMCU Board version 2.3.0 Its very important other wise Alexa dont discover devices. #define WIFI_SSID "..your wifi name.."
#define WIFI_PASS "..your wifi password.."
// this way it's easier to match devices to action without having to compare strings. // default, this means that it uses WiFiUdp class instead of AsyncUDP. // whilst the former works fine with current stable 2.3.0 version. After complete uploading code how to connect alexa. edit the code. set your wifi password and wifi ssid. then open serial monitor, alexa will automatically get conected. no sir alexa is not connecting.. please help me….